NEW PRODUCTS – Arcade Buttons with LED – 30mm: Translucent Red / Blue / Clear « Adafruit Industries – Makers, hackers, artists, designers and engineers! A button is a button, and a switch is a switch, but these translucent arcade buttons are in a class of their own. Particularly because they have LEDs built right in! That’s right, you’ll be button-mashing amidst a wash of beautiful light with these lil’ guys. 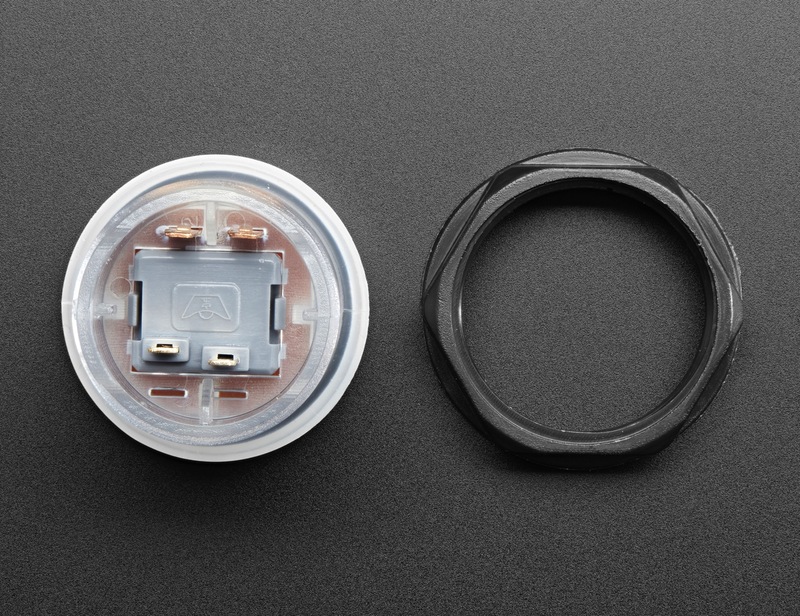 They’re the same size as common miniature arcade controls, and require a 30mm diameter hole for mounting. Thus they are sometimes referred to as 30mm diameter. The buttons screw in place, so you can use with up to ~20mm thick material, and will cover up if the hole if it isn’t perfectly round and clean. The action is smooth, without a strong click, yet you can definitely feel when the button is pressed. A tiny micro-switch is pre-installed, with gold plated contacts. Even unlit, they look fantastic: all of the colors have a crystal translucent glossy look. As noted they have two surface mount LEDs with resistors built in, buried in the button body. Next to the switch contacts are two additional contacts for powering/controlling the LEDs. The two LEDs are connected in parallel with ~1K resistors each, so you can power the LED from a microcontroller pin or direct from 5V (say USB) with 10mA draw. You can go down to 3.3V power, only 2mA per button, but they’ll be dimmer. 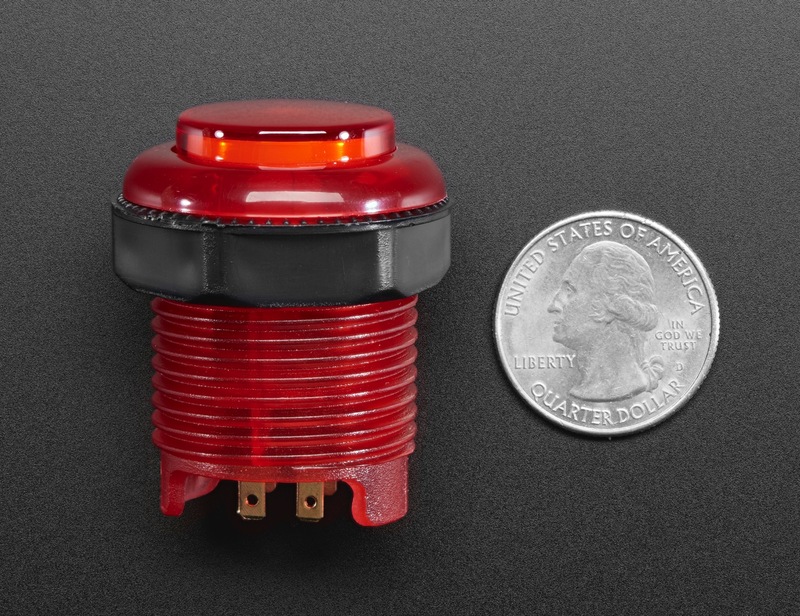 Note that the Red and Yellow versions of these LED buttons cannot run at 3.3V because the LEDs are in series! 5V or higher is required. These sleek 30mm buttons are currently available in Translucent Red, Translucent Blue, and Translucent Clear.